Cheese Sandwich Recipes, Collection of Veg Cheese Sandwich Recipes. We have an interesting collection of cheese sandwich recipes. These grilled cheese sandwich recipes are especially loved by kids. From chocolate based cheese sandwiches to cottage cheese (paneer) sandwiches, here is a collection of veg cheese sandwich recipes. Cheese Sandwich recipes for kids is an easy snack to give. This easy and quick Tomato Cheese Sandwich recipe tastes amazing and makes for a perfect kids afterschool snack. The juicy mouth-feel, vibrant colour and yummy taste of tomatoes make it a great hit with young and old alike. But, if your kid is not a fan of tomatoes, try this cucumber cheese sandwich. Also, you can combine cucumber with paneer to make a sumptuous cucumber cottage cheese sandwich. If your child is a fan of spicy food or loves chutney, try this Chilli Cheese Toast recipe that uses two varieties of cheese in just the right proportions and a sprinkling of mustard powder along with the chilli flakes. The Chutney Cheese Toast sandwich recipe as the name suggests is buttered bread lined with spicy green chutney, cheese and toasted till the cheese melts and mingles with the chutney. The cold cream cheese sandwich is everything you could ask for – filling, refreshing, tasty! An intelligent combination of juicy and crunchy veggies with cream cheese, herbs and spices, makes this sandwich an enjoyable treat. The spinach and paneer open toast recipe is another wonderful after-school snack for kids, an apt starter at a party, or an anytime snack for the food-lover! Everyone loves Grilled Cheese Veg Sandwich Recipes and we have a huge collection of the same. Common though it sounds, the Grilled Cheese Sandwich can be a masterpiece if prepared perfectly, with the right proportions of cheese and butter. Most people make the mistake of preparing it exclusively with one type of cheese, but the secret to getting the ideal texture is to use a combination of cheese. The Indian version of Grilled Indian Cheese Sandwich Recipes combines cheese with various veggies and beans. The Rajma and Cheese Grilled Sandwich is quite easy to make, and absolutely tasty & sumptuous too! One of my favorite is the Potato Cheese Grilled Sandwich made with an amalgam of spices, potatoes and cheese housed within the crisp grilled sandwich! Tiffin Cheese Sandwiches. Simple though the pineapple, celery and cottage cheese sandwich might seem to you, it continues to be a hot favourite with kids of all age groups! The vegetable sandwich with feta yogurt spread, vegetable cheese sandwich with honey mustard dressing and herb cheese and roasted capsicum sandwich are some other sumptuous recipe that can be packed for tiffin. Try our healthy cheesse sandwich recipe which is carrot and cheese sandwich made with brown bread, paneer and mozzarella cheese. Munch on this innovative and nutritious vitamin a, protein, calcium and iron rich recipe. Paneer and cheese if consumed in moderate amount can do wonders for your bone, whereas carrot – excellent source of vitamin a helps to improve our immunity levels. Cottage Cheese (Paneer) Sandwiches are easy to make as every Indian has some paneer at home. Cabbage and paneer grilled sandwich recipe, although both cabbage and paneer are bland ingredients, the hints of green chillies and coriander lace it with an enticing flavour, and the overall effect is rather pleasing to the palate. Try this delicious open cottage cheese and cucumber sandwich with a topping of grated paneer and chopped cucumber with curds for binding and green chillies for spice. Sprigs of parsley impart a herbed feel to the cottage cheese and cucumber sandwich. Pineapple and cottage cheese always make a great combination in pineapple celery cottage chesse sandwich recipe. This is because the succulent and mellow flavour of cottage cheese contrasts starkly with the crispness and tang of pineapples! Here, we have made a delicious cold sandwich using this evergreen duo, with a sprinkling of fresh celery to add more zest to it. 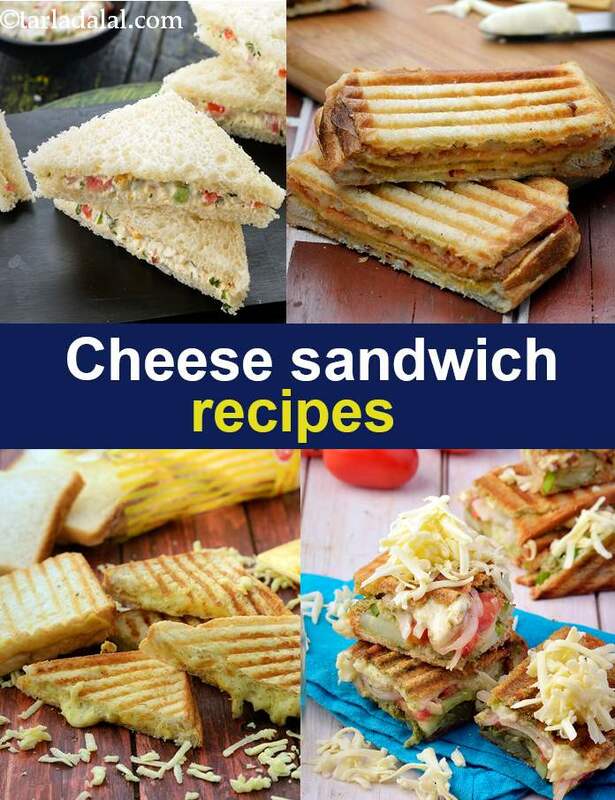 Enjoy our Cheese Sandwich Recipes, Collection of Veg Cheese Sandwich Recipes and other Sandwich recipe articles below. The winning combination of cheese and apple slices is what makes this sandwich a favourite. You could use whole wheat or multi-grain bread for a healthier option, and pipe smiley faces with strawberry jam.